Newport in Oregon describes its Oregon Coast Aquarium as world-class. 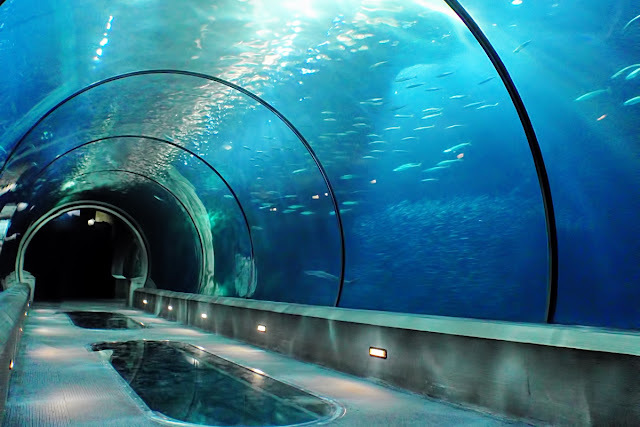 One of its most popular exhibits is the "Passages of the Deep"... a series of Plexiglas tunnels through which you can watch undersea animals all around you. What's interesting is that the tanks were originally part an enclosure built for the orca whale known as Keiko, the star of the movie Free Willy. Keiko's full story is, unfortunately, a sad one. I was bothered that the shark tank didn't have any natural landscaping... just this big featureless tank filled with sharks, rays and smaller fish that could do nothing but swim around in endless circles. Maybe there was a good reason for this that I couldn't guess at, since all the other tanks were fitted with natural plants and rock formations. We are glad that you enjoyed your visit at the Aquarium! To answer why the shark tank does not include the plants and rock formations of the other tunnels, it is supposed to imitate the environment of the open sea. Most of the species represented in this exhibit live in the upper strata of water, commonly referred to as the Sunlit Zone, where there are typically no towering kelp forests or narrow rocky channels.